I like lace, but I don’t have much experience with it. The only lace item I have ever made was in about 1984 when i attended a dressmaking class in Moss Side Manchester. I think I used a Vogue pattern and I chose a soft, lightweight black cotton. The dress is a very simple style with pockets (Very Easy, Very Vogue?) and is a classic rather than a typically 80s style. I remember the tutor showing me how to make the lace yoke. I had completely forgotten about this dress. So when I Kondoed all my clothes I came across it. It hasn’t been worn or seen the light of day for about 32 years! I can’t believe the tutor allowed me to do a handmade button hole with grey thread. Perhaps I didn’t finish the dress in the term time and I had to make do at home (without a sewing machine). But the lace yoke was done well, and I am proud of that. Fresh from my success with the H&M dress, I thought I would have a go at reproducing a RTW item that I liked and didn’t want to rip up. So I chose a favourite (but inexpensive) lace skirt from Zara’s sale. I wear this skirt quite a lot for work, matching it with a white shirt, and more recently with my red silk shirt. I like it because it is not boring, but it is knee length and classic. It has an exposed brassy zip at the CB. Also the blue is just a little bit greenish so it works well with a bottle green jacket to look like a suit, but not too matchy-matchy. And lace has such lovely texture. But this is not a quality item. The lining has a raw edge and is a funny cottony knit fused to a shiny, slippery back. It shrunk and twisted in the wash. Nevertheless I enjoy wearing it and thought I would try to copy it. I examined how it was made, and was quite surprised that it was just one piece of lace, and one piece of lining, no side seams. This is clever – it avoids all unnecessary joins (a bit of a nuisance with lace), and of course it is super economical. 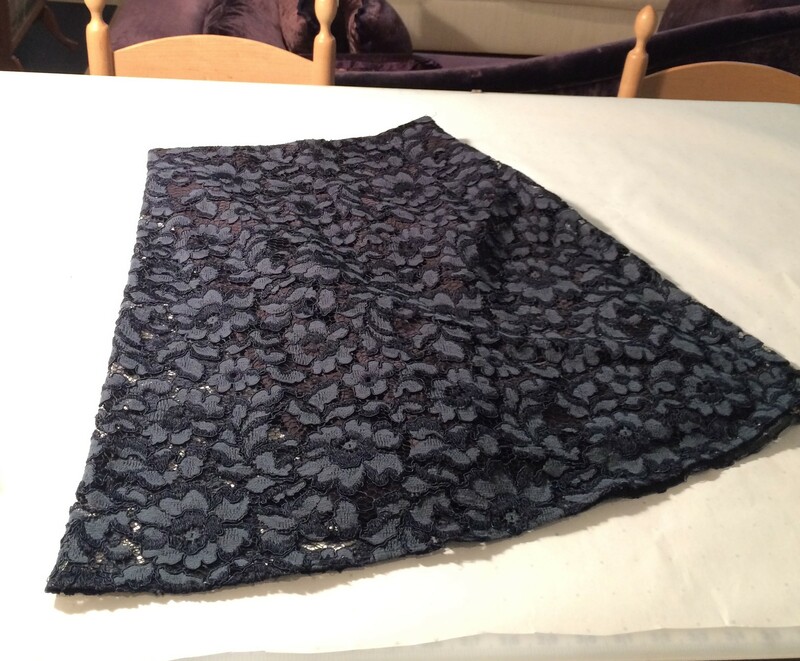 I measured the width of my lace and found it was a touch too narrow to make this exact design, but with a little alteration I made up a pattern that would use the full width of my lace to create a one-piece skirt. I chose a fairly firm navy silk to line it with. I think this will be ideal as it would just about work as a skirt in its own right, so it will give some body to the skirt. Also as my lace is beige I thought the navy background would bring it more into line with my wardrobe. I do have enough lace left to do a second skirt, and I am thinking of dying the lace to a more beautiful colour. It is not that I dislike beige (beige, grey and white are such great wardrobe staples for me), but I wouldn’t really enjoy wearing a beige skirt. Obviously the CF is on the left, and you can see how the side seam is now a deep dart, and there is smaller dart at the back waist. I have come across this style of pattern fairly often during the 1960s and it works fine, although of course one must sacrifice a nice straight CB grain line. As the CB is now a bias cut it will require thought about the zip insertion. I stitched the darts by hand, lapping them. They are not very obvious, which is great. I pinned it on to Camilla and realised the lace and the backing fabric need to be basted carefully together before I proceed. Had you spotted the dinosaurs? Ted tells me it is a Triceratops – I think he may be right. I also need to think about the zip, hem, and waist finishes. I have tried a few ideas, but they aren’t great. Any suggestions on how to construct this skirt please? Oh what fun. I have some dark brown lace I would like as a skirt this Autumn and am very inspired. I’m fascinated that it only has the one side seam. That lace is awesome! Is it a recent purchase, and if so where from – I would love to wear that. 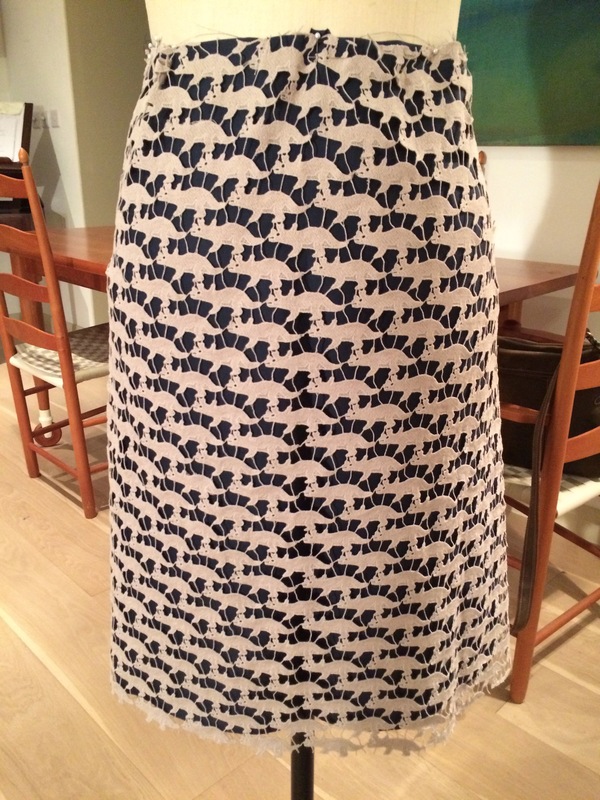 Your skirt is going to look wonderful, and the pattern is very quick and easy to execute which is a bonus. I wonder how many people will notice the dinosaurs when you wear it? I bought three meters of this beige lace, because the navy was all sold out. That was the end of it. Sorry. I should have bought the lot when I first saw it (one roll of each at Simply Fabrics) and sent a piece to all my friends. Sew the zip into the silk [stabilise first of course]. Fasten the lace over the top of the zip using those little ‘invisble’ press studs. For the hem: finish the lining in your preferred way, and cut the lace carefully round the pattern to give a dinosaur-scalloped edge. Cool! In fact, it looks like you already have, apart from cutting away the little eyelash connector bits. I love that lace- did you get it at the same time as you bought the navy dinosaur lace? Since the waist is slightly curved, I’d make a facing with the same curve and attach it and flip it to the wrong side, no waistband needed. Treat the lace on the center back seam like one unit with the lining. Stitch them together just like the waist top edge. You can hem the lining first and leave the hems separate as demented said and trim the dinosaurs to be scalloped. Now for the zipper, that might be a problem with so much space between dinosaurs but with the center back seam treated as one unit, it may be OK with an invisible zip or regular. 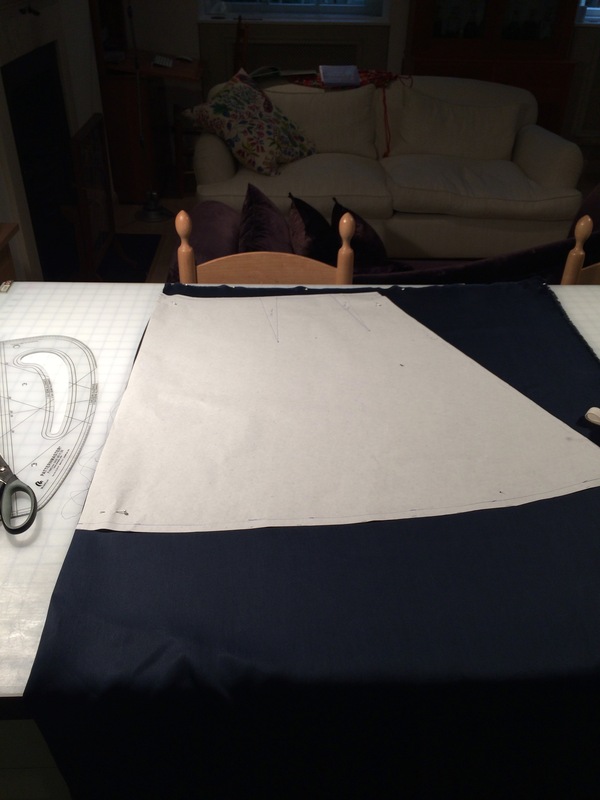 I was also thinking about binding those edges with the navy lining before insertion or just attaching a strip of the navy to use as a cheater strip to use to attach the invisible zipper and then it is hidden inside. I have no idea how to finish off your skirt but I absolutely love it and of course the dino lace! I’m also impresses with your lace dress from the 80’s. So glad you kept it, it’s very classic and not a hint of the 80’s. I’m like Cathe in that I don’t know how to finish this, although it seems that with the blue backing stabilizing the lace it should be OK to put in the zip. I can never visualize things before I start actually doing them though. I also like your dress from the 80s. Will you wear it or do something with it? PS You’re making me want to get a lace skirt, although I’m working on a different skirt at the moment. Hi there – I made a white lace over black lining skirt in the ’90s, it looked chic then and your’s looks chic now! I love the contrast, think it’s unexpected and playful as well as being elegant. I finished mine with gosgrain ribbon that I simply flipped over to form an interior “facing’ that also functioned somewhat as a waist stay. I believe I hand sewed in a zipper and slipstitched the lining to it. I look forward to seeing how this progresses. I’m not at all sure how this works in one piece. How about a grosgrain ribbon waistband? Yes. I will try that. Thank you Carol. Lace dinosaurs! That is just the best. But I have a question (it’s probably really ridiculous to those who know things). I wonder about the back seam. Does it lie flat? I guess the flare is picked by the flat front and evens it out all around? Sorry to be so dense. To be honest the back seam is not very satisfactory because it is not cut on the straight grain. I will write up what happened in a few days (and this story does not have a happy ending Jennifer. There’s a new class on Craftsy by an english teacher – Alison Smith. Its called the Essential Guide to Sewing with Lace and its excellent! OK. I am going to try that. Thanks for the tip Lesley! I made a lace skirt a while back that had three layers. The lace and underlining were treated as one layer with narrow french seams, then I added a lining. Amanda’s adventures in sewing blog also has some excellent examples of workmanship on lace projects. Good tip Gail. Many thanks. Sounds like a fabulous idea Olivia, but sadly this lace was sold as a remnant, and is no more. Good luck with finding something suitable. Do let me know how you get on – I would love to hear what you come up with.